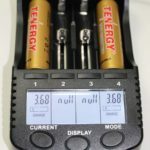 Tenergy has been making pretty good batteries for many years. Now, as progression would dictate, they’ve entered the realm of chargers! 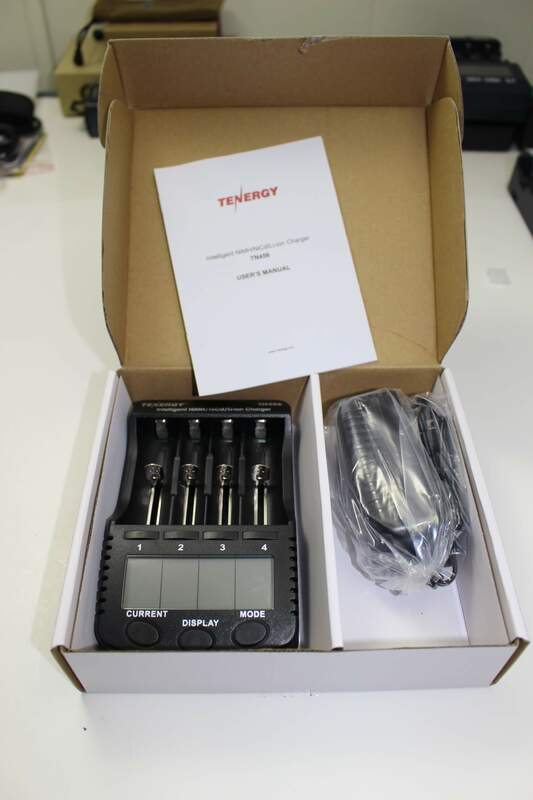 So today, I present the Tenergy TN456 “intelligent battery charger”. There’s not much to talk about here. 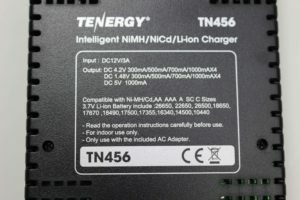 With the TN456 you get an AC charging adapter and a user manual. 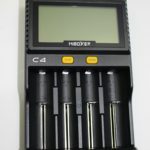 With most chargers these days, (including the TN456) all battery “types” are accepted; NiMH, NiCd and Li-ion. 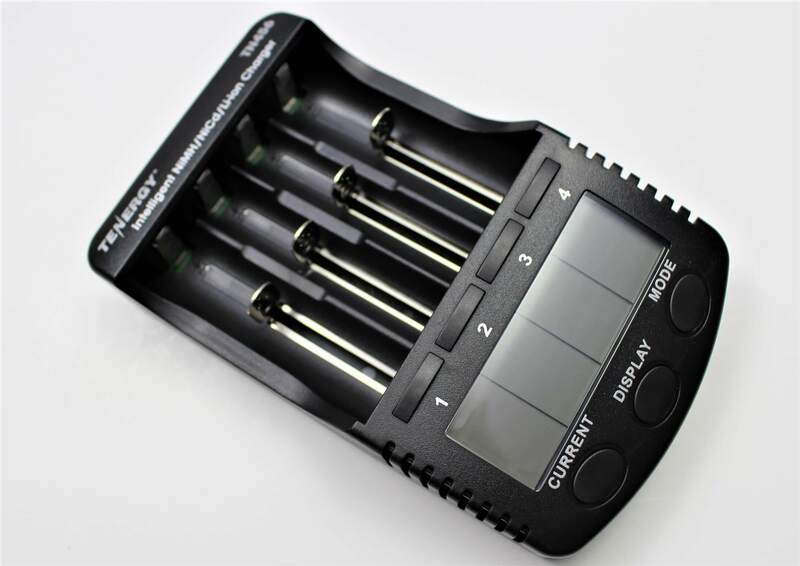 Acceptable battery sizes include the most popular lithium-ion sizes; 14500, 16340, 18650 and 26650. Other sizes include 10440, 17335, 17500, 18490, 17670, 26500 and 22650. 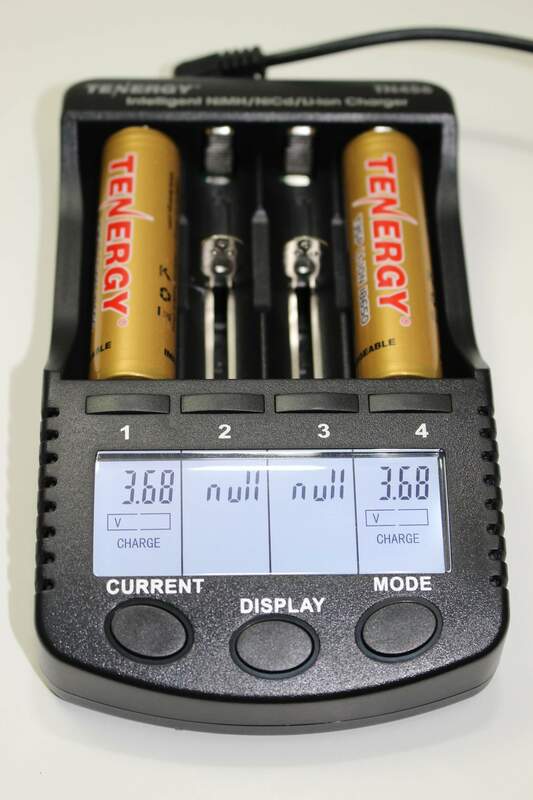 There’s also A, AA, AAA and C.
So How Does the Tenergy TN456 Work? Place a battery of your choice in one of the four slots. Put up to four all at once if that’s what you want. 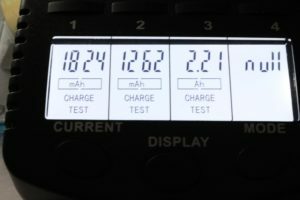 The display will start blinking with the current voltage of the battery(ies). If within a few seconds you do nothing, the display will show “300mA” (as the default current) and begin charging. 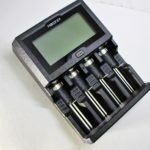 The unit will automatically determine what type of batteries are in the slots. If you don’t like the default settings, you can change them…at any time! You can do so immediately, or even wait how ever long you’d like to, and change them later. I can’t honestly think why you’d WANT to do that, but just so you know you can. To change what the charger has already started, either press and HOLD the “mode” button for one second, or press the corresponding button for the channel the battery is in that you want to change. When the display begins flashing, that’s your cue to press whichever button will have the effect you desire. If you want a different current, press the “current” button. If you want to perform a test on the battery, press the “mode” button. 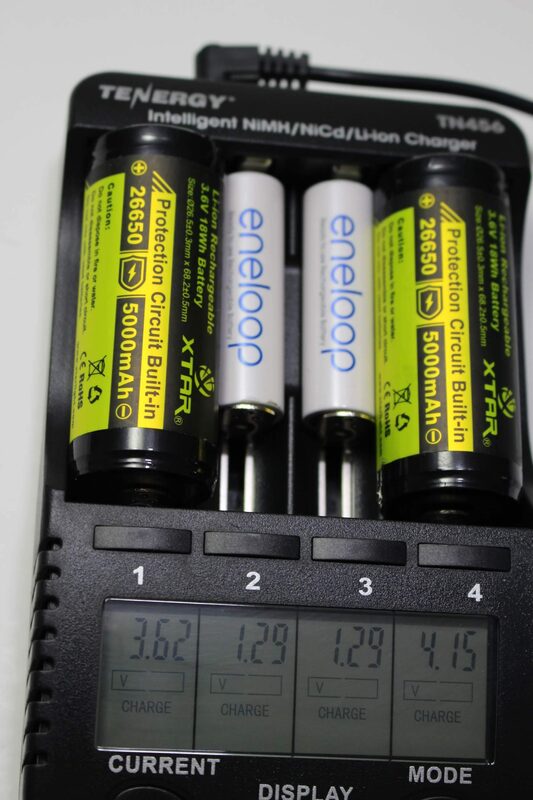 Batteries of different sizes and chemistry can all charge together. 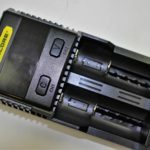 In a photo further below, you can see that two larger 26650’s can fit on either end, with two smaller Eneloop’s (NiMH) sandwiched in between. 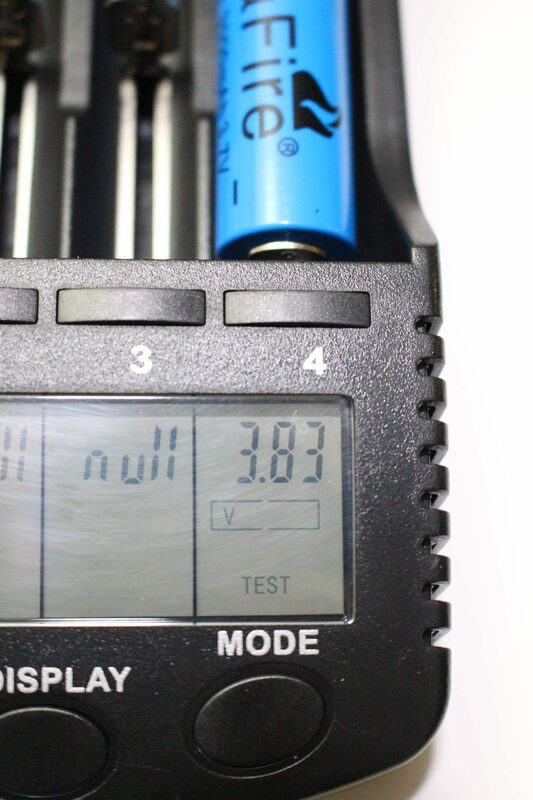 When the charge is complete, “FULL” will be displayed, and 4.21 will be the ending voltage. If you leave the cell in the slot it will get fed a “trickle charge” until you remove it. Repeated pressings of the DISPLAY button will reveal the ending results following a charge. Please refer to “the display button” heading below. 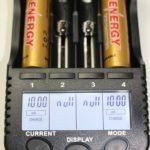 So, you want to know what the capacity of any given battery is? Fine. Put the battery in any of the four slots, wait for the display to “blink” then press the “MODE” button until you see “charge/test” and let it do its thing. 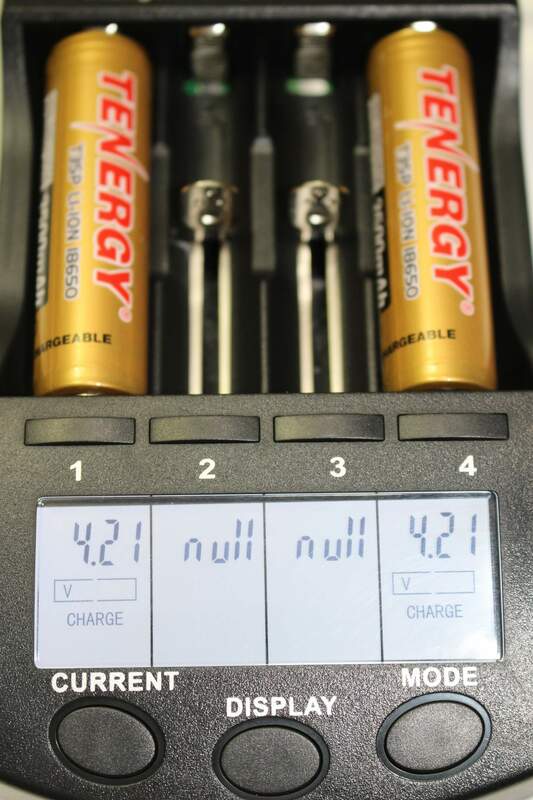 The battery will charge completely, then the display will change to “test” while it discharges the battery. This is usually done at a current of 500mA. As soon as its depleted, it’ll charge it again, and the display will show 4.21 volts when it’s finished. 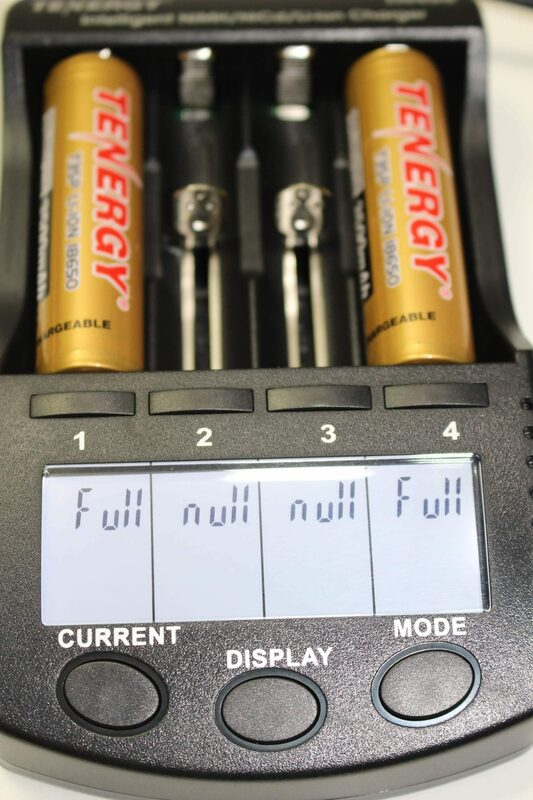 It will NOT say “FULL” as it does after a stand-alone charge cycle. Toggle through the results by repeatedly pressing the “DISPLAY” button. It will give you the total mAh the battery took, in addition to impedance, and elapsed time. 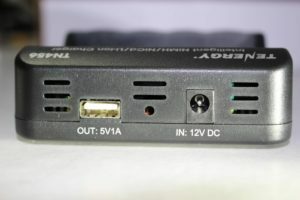 On the rear of the unit is a USB output. This can be used to charge other devices, such as a USB rechargeable flashlight, or a cell phone… among other things. The charger does not need batteries in any of the slots for the USB function to work. The Tenergy TN456 is easy to use. 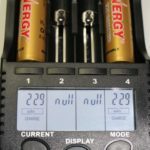 To accept the default charging current is as simple as placing a battery in a slot and doing…. nothing! How does that sound? 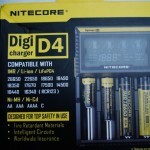 To test a battery is just as easy as described above. 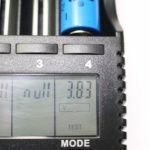 The TN456 is supposed to be intelligent enough to detect when a battery is safe to charge. 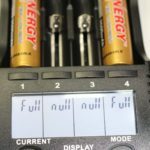 If it IS an unsafe battery, the display will not advance past “NULL” after inserting one. If you any unfortunate reason the elapsed battery charging time reaches 19 hours and 59 minutes, it won’t shut off… it’ll just reset the time counter back to zero! 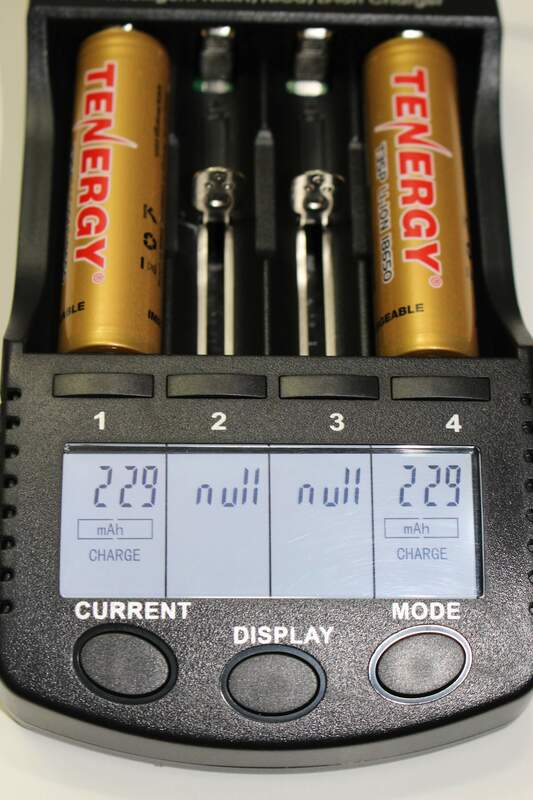 Some chargers display “real-time voltage” when a battery completes its cycle. 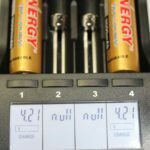 With the Tenergy, it’ll just say 4.21 volts, but I guarantee if you test the charged battery on a multi-meter, it’ll read less. There’s nothing inherently wrong with the charger… that’s just what it does. I have others that do that as well. Another thing the charger does (or doesn’t do) is indicate whether the charging voltage has dropped, as the cycle is about to end. Many chargers that display the charging “current” will normally indicate its natural drop as battery capacity is reached. With the TN456, it doesn’t change. If you set it at 1000mA, it will STILL read “1000” even when the voltage says 4.21 I’m not doubting whether that’s correct or not, I’m just pointing out that many chargers don’t do that, so in a sense, it seems odd to me that it would STILL be providing that high of a current, as capacity nears. And, something else to be aware of; the digital “windows”, being the size they are, is somewhat limiting to the digits themselves. Because of this, you might notice something odd at the completion of some charge cycles. I hope my explanation below makes sense. 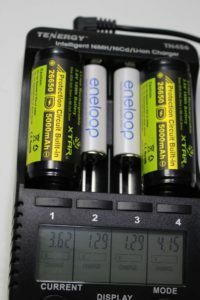 The TN456 measures battery capacity in “mAh”. BUT, due to the size of the display area, when there are FOUR digits displayed, the farthest LEFT digit can only be a “1”, not a “2” or any other digit. So, for battery capacities of 1999mAh and UNDER, all is normal. But, as soon as that figure reaches 2000 and beyond, it must reduce the number of digits in the display to THREE. This action changes the display to read “Ah” instead of “mAh”, and in the process it alters the final readout as well. An example of this is illustrated in the photo. In the photo above, the first TWO charging results are less than 1999 (so FOUR digits are shown) as an “mAh” reading. 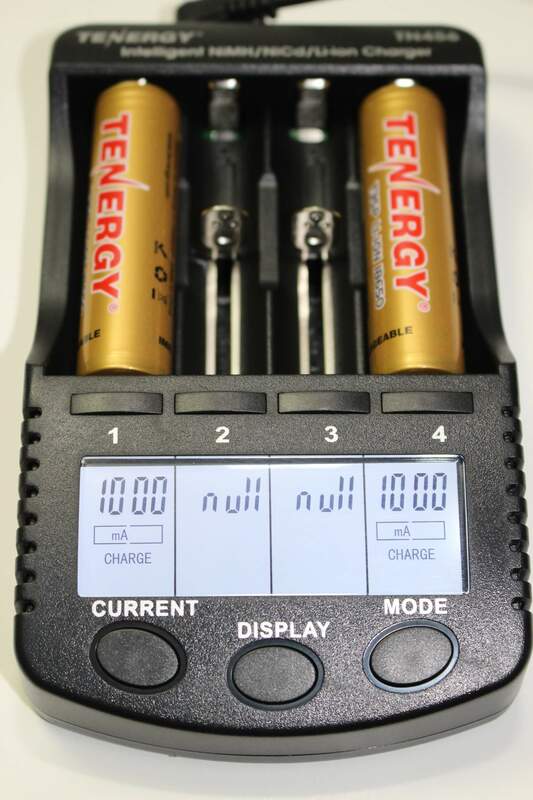 In the THIRD display, the charged capacity is ABOVE 1999, therefore the amount is changed to “Ah”and only THREE digits are permitted. 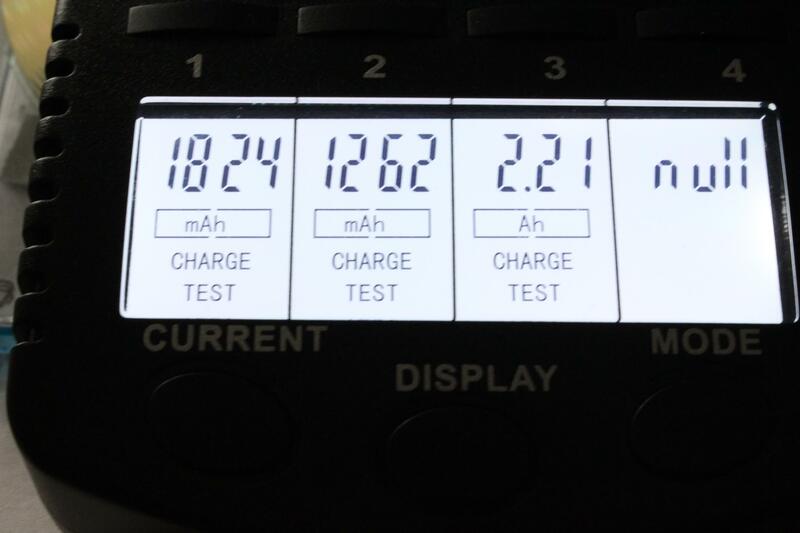 So, 2210 mAh, becomes 2.21 Ah. 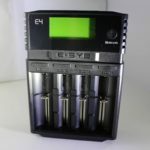 The TN456 uses a “constant-current, constant voltage” algorithm for lithium cells which is the preferred charging method. 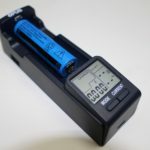 Using a quality charger, such as the Tenergy, is always your best choice when considering one… even if you prefer to use “cheap” rechargeable batteries, which isn’t usually recommended. 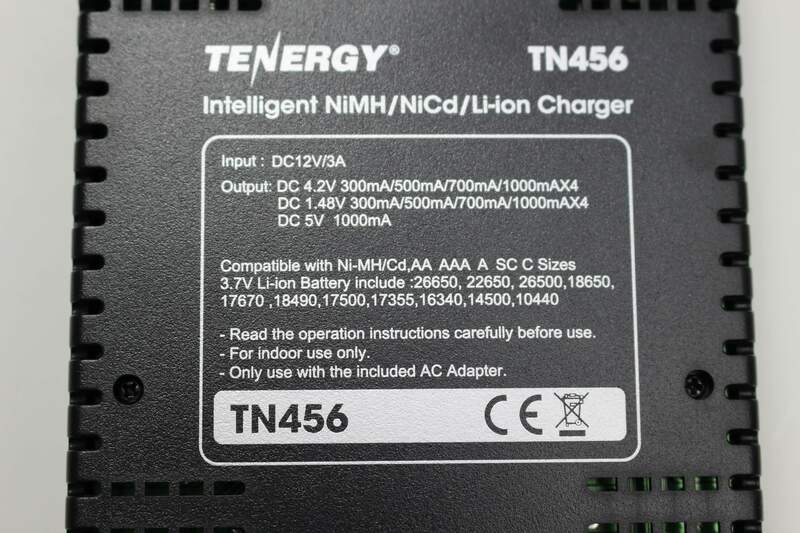 As far as all-purpose chargers go these days, the Tenergy TN456 is very capable. 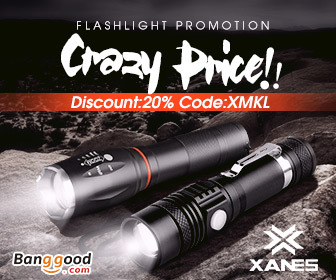 If you’d like to try it for yourself, you can visit its page on Amazon by clicking here. Thank you thank you. I bought one of these and could not for the life of me follow the instructions that came with it as the numbers didn’t make sense well now they do. Great job on the whole review.